Tommy Two Flops, dear friend, founding member of Montague Mob*, and guy who talked me into starting this thing once we saw how deep X went this year, will be chipping in from time to time. Here’s his debut! The key to the move Mader made here (on the video) is his bet sizing. He was basically min-raising (raising the same amount as the previous raise. X bets 4, Y raises to 8, X reraises to 12) That is how limit poker works but in no-limit you can raise up to your whole stack (going ALL IN!). When I learned about no-limit it was common to bet between three and four times the previous bet as that was thought to put more pressure on by increasing the amount of money your opponent then had to put in to stay in the hand. For reasons I still don’t fully understand, in the last five years, that has changed greatly. The poker players usually min bet or slighty more than min bet. This increases their range of options and I think provides some game and math theory advantages. Raisng three or more times the minimum bet exposes you as an amateur. One of the first things I remember Player X telling Jamie was that when the two of them played in tournaments together (on Poker Stars) X saw that Jamie put three times the bet into the pot preflop, which it made it more likely X would play the hand against Jaime because there was more money in a pot that X felt confident he could win by outplaying an amateur. In the biggest tournament I’ve ever played, I was doing great until I ran into a player who exploited me in this exact way. It took me three confrontations to realize what was happening, and by then I had lost half my stack. 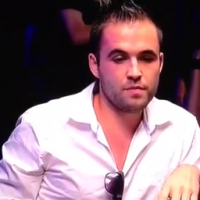 There wasn’t enough time for me to develop any negative feelings about the guy – to me, Carter Gill just looked liked a million other really smart poker players trying to keep up a confident facade. I was impressed with his lucky read of his opponent (David Paredes, who’s a very well respected player, btw). Judging by Gill’s devastated reaction I’m gonna guess he is in massive debt and had dreams of clearing his ledger with a deep run in the Main Event. haven’t made an awesome poker database or anything like that at all.